After we have summarised our achievements in 2018, we present to you a closer look at the most important things that happened on the Mintos marketplace last year, and what will be the things you can look forward to when it comes to our activities in the upcoming period. We gathered some numbers and words, some values and quotes from our team members. We hope you will enjoy our success story from the previous year because it is you who has helped us a lot in gaining the position of European leader in the loan investment market. DIVERSIFICATION – of new loan offerings and investors, in new countries and on new continents. NEW FEATURES – launching a bunch of them! And most of the new features are almost exclusive for Mintos: investment strategies, secondary market Auto Invest, two-factor authentication and Mintos ratings. BILLION – we have reached EUR 1 billion of investments in loans on Mintos in August and got super close to EUR 1.5 billion already in December of 2018. SCALING UP – we have expanded our team by twofold and moved to an office twice the size. ACQUISITION – we have reached (almost) 100k investors by the end of December 2018. CHOICES – we have significantly increased the number of payment options for Mintos investors. SERIES A – we have raised EUR 5 million in a Series A funding round to continue the development of our products and services. GROWTH – we have become the largest marketplace for investments in loans in Europe (according to P2P-Banking). M. S: Our upcoming activities are a logical continuation of things we have been doing since 2015. The Series A funding we closed in November 2018 was a EUR 5 million boost in capital that will be invested in the expansion of our product offering for both existing and new investors on the Mintos marketplace. Our plans for 2019 were already set while executing the plans last year; e. g. while making preparations for providing international bank account numbers (IBANs) and launching a Mintos debit card – projects that are in the centre of our attention for 2019. Our application for the European e-money license should be approved by the end of Q2 2019 and this will enhance the overall experience for our investors. At Mintos, our investors’ experience is always in our focus, and the European e-money license will provide easier access to and even more security for Mintos investors’ funds. By providing the best possible experience for our investors with the support of available technology and Mintos know-how, we will continue expanding on the global market, attracting new loan originators and new active investors. To support the growth and product development, we will continue expanding our teams with top talent. As all this is in symbiosis, I can say that the 2019 plans are not specially made yearly plans. They are a further development of plans we have already had from the beginning of the Mintos marketplace and we are satisfied with our progress. What do you see as the biggest win for Mintos in 2018? M. S: The biggest win for Mintos in 2018 was that in 2018 we managed to grow a lot while remaining profitable. 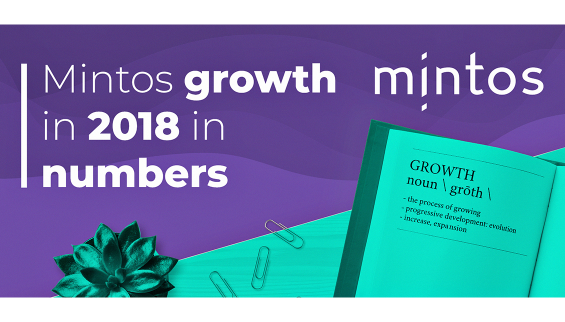 In addition, we acquired a large number of new investors from the referrals of our existing ones (with the share of 63% of total new investors on Mintos). Our retention rate of more than 90% for the active investors is very satisfying. Right around the end of 2018, we reached 100,000 registered investors. We also reached a milestone of EUR 1 billion of investments in loans on the Mintos marketplace in August 2018 and added another EUR 0.5 billion in only four months thereafter to reach EUR 1.5 billion of total loans funded. According to various sources, Mintos has become the largest player in Europe by the market share. All of us on the team are very satisfied with the results of our work. What have you personally learned from 2018 that you plan to use for new business challenges in 2019? M. S: I have reinforced my belief that before you have a great company, first come great people. These people do the work they enjoy, and such work builds great products and services. A great product eventually brings great profit – which makes everyone satisfied. Investing in people and product, while not being afraid to experiment here and there is a great framework that builds a good and profitable business. What are the plans for new developments of the Mintos product in 2019? M. G: Our top priorities are to provide IBAN accounts and debit cards for our investors. We will also be working on the development of the mobile app. Another great inspiration source where a lot of our work and innovation comes from is the backlog. It is where most of the new ideas are being born, inspired by Mintos investors’ feedback. What are two main things which you want to improve on the Mintos marketplace and deliver more value to investors in 2019? M. G: We want to enable our investors to get the maximum benefit out of our Auto Invest feature. We will make this happen by providing investors with even more insights and statistics about each Auto Invest strategy. Alongside this, we will continue enhancing the user experience of the Mintos marketplace. How do Mintos’ investors help shape the product? M. G: By sharing their feedback, which is very valuable for us. We have a huge backlog of ideas that come from our investors and when we work on the specific feature, we always consult the previously received notes to improve the existing functionality. It is hard to imagine working without our investors’ observations, and at Mintos we are endlessly thankful for the feedback we get. Will Mintos be more focused on following the trends of the fintech industry, or developing its own innovations in 2019? M. G: Of course, we will still be working on our core product that has proved to be a success according to the achievements we have made so far. That core product is investments in loans, and we will continue making that function more user-friendly while adding additional features inspired by our investors and developed by our teams. Anyhow, as we have grown as a business, so does the focus for both Mintos and all stakeholders included and we will pursue new initiatives. When it comes to the product, the most important two of those initiatives are the introduction of the IBAN account number and debit cards for Mintos’ investors. *Mintos totals in Week 1 of 2019: 58 loan originators, 28 countries of loan originators, 70 countries of investors, EUR 31.8 million of interest paid to investors, 101 673 investors on Mintos, 7 languages, 62 people in the Mintos team, EUR 1.52 billion total investment in loans.